There’s no doubting that the Trident/Mercury combination brings the goods. The Quintrex factory wrap offsets the jet black motor and the angular lines complement each other. 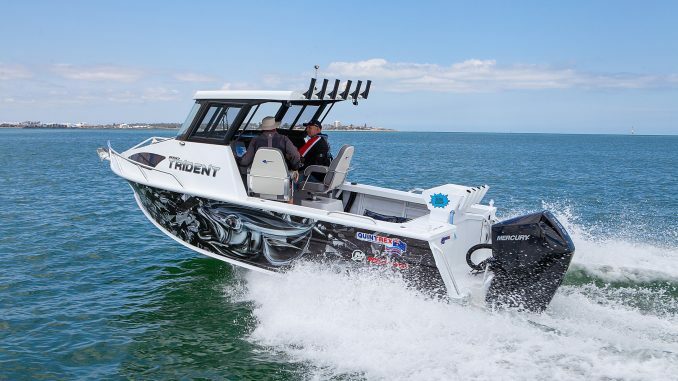 For all of the Telwater Yellowfins I’ve tested over time, I’d never done a Quintrex Trident, so we were pretty excited when Mandurah Marine arrived with a 650 Quintrex Trident Hard Top loaded with one of the new Mercury V-6 3.4L 200HP four strokes. 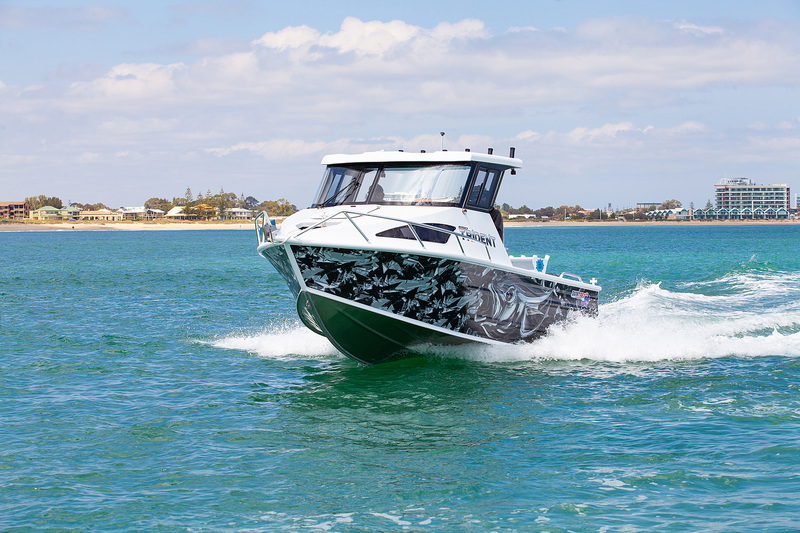 There’s no denying that it’s a good looking package – with the Australian built hull and trailer matched at the factory, complemented by a dark factory installed wrap that matches the jet black and futuristically styled outboard, but it’s in the water where a boat really needs to impress. So, we launched the rig at the public ramp at Mandurah and took her out to sea. First impressions are strong. 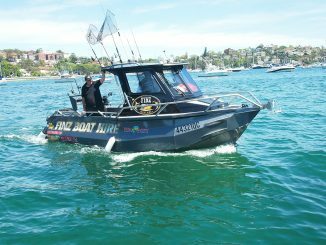 This is a plate boat with a full, unpainted, aluminium chequer plate deck that would be well suited to some serious fishing mates doing some serious miles in their search for fish. A pleasant day on the water with no real chop or wind swell didn’t really give us the chance to put the Trident through its paces on a lumpy ocean, but it did allow us to complete a full set of performance statistics. As expected, economy with the new Mercury peaked at 1.65km/L at a cruising speed of 48km/h at 4,000rpm. The V-6 was very quiet at cruising speeds and travelling was pleasant on the calm seas. The motor revved out to 5,750rpm while achieving a top speed of 74km/h. Notably, economy tanks at the top of the rev range and delivers around 1km/L. 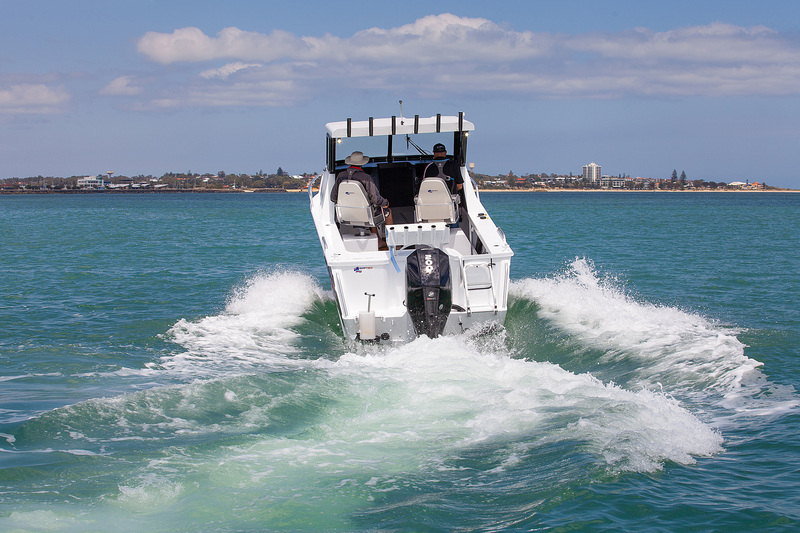 The whole idea of a hard top is to offer a part of the boat that’s right out of the elements for when things get hot, rough or nasty, while still leaving ample cockpit room for activities like fishing. The Trident gets this balance right. 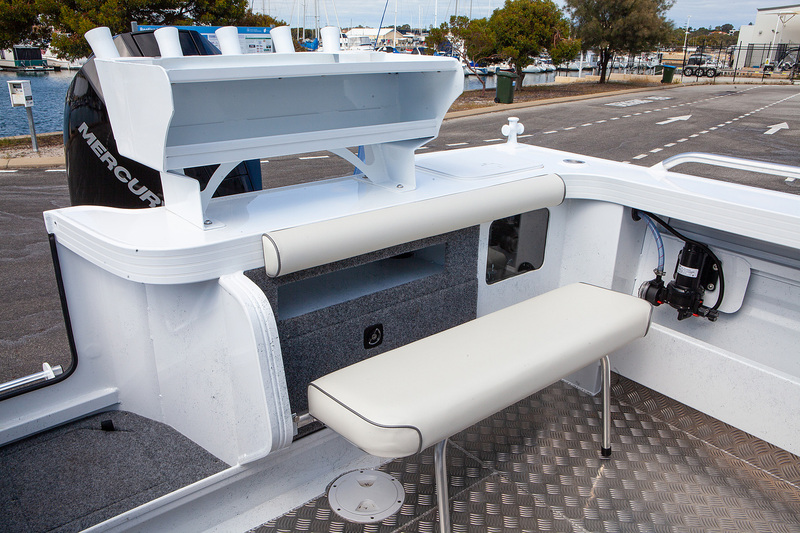 High gunwales and a 2.48m beam combine to make the Trident a great compromise between comfort on the go and stability at rest. The Trident cruised most economically at 4,000rpm where it delivered 1.65km/L and just under 50km/h. 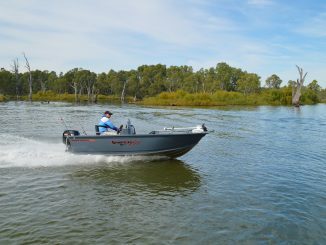 The Mercury 3.4L platform has the reputation for providing increased mid-range torque and the rig definitely packed a punch getting out of the hole. 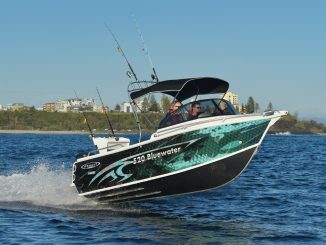 There’s plenty of freeboard to keep you confidently fishing in open waters. On water transom access for swimmers is easy with the duckboard, transom door and fold down ladder. 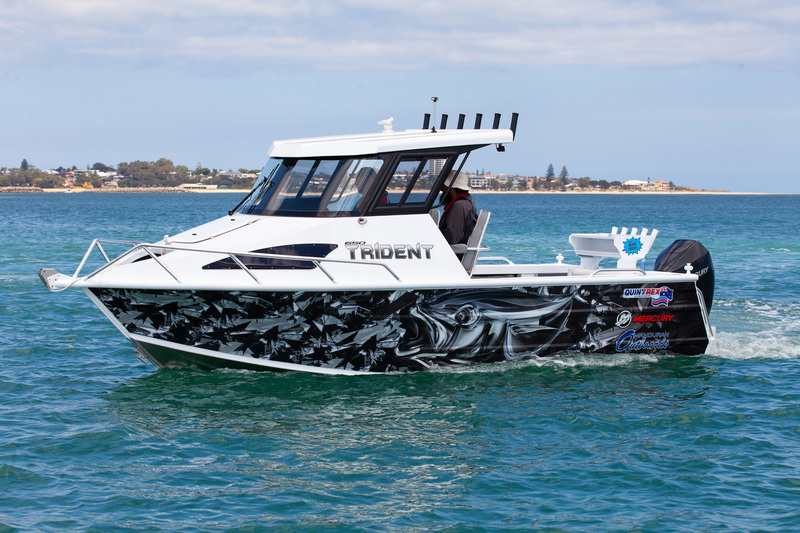 This Trident took the option of extra fuel capacity instead of underfloor kill tanks, giving the rig 250L in total and over 400km of theoretical range. 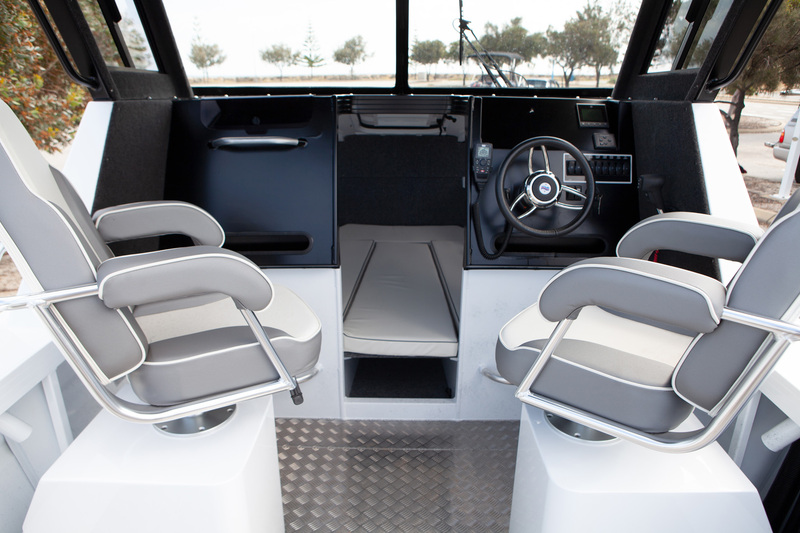 A pair of comfortable helm seats with storage underneath them is all a serious angler needs. Carpet-free checker plate floors look practical and they are - you can clean up with a power washer or a garden hose. Plenty of room to stretch out here. Not so sure I’d want to share the space with a couple of mates for an overnighter. 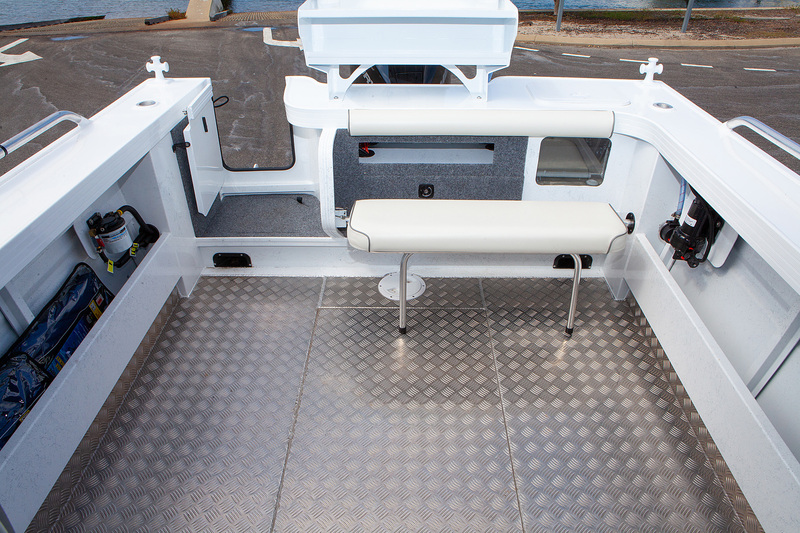 The rear bench seat folds away when you’re fishing and the transom bait station features a second shelf to hold the gear you use all of the time. The test boat came with a berley pot built into the transom. 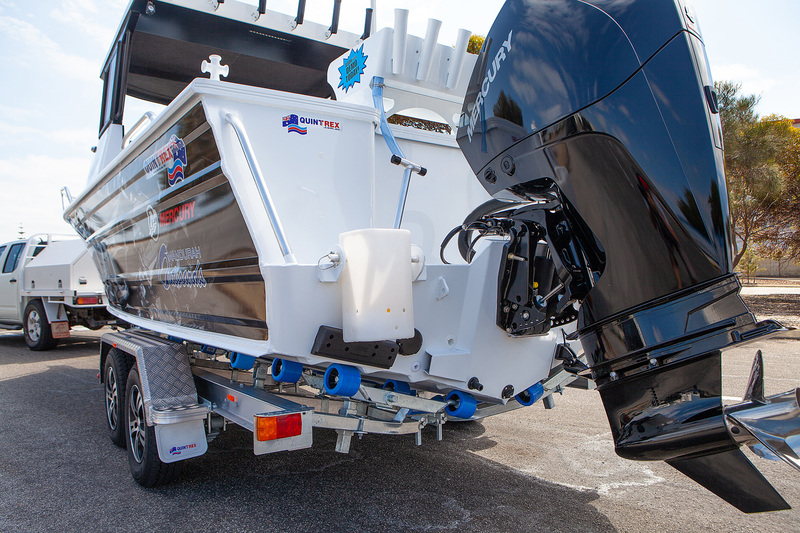 Supplied on a twin-axle Quintrex trailer with electric hydraulic brakes, the Trident will tow behind most twin cab 4WDs quite easily. 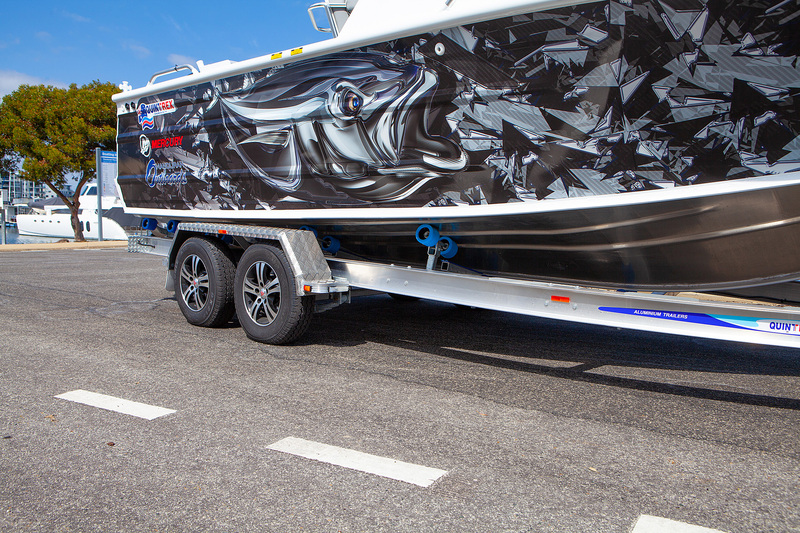 You know that this rig will turn heads at the ramp and on the water. 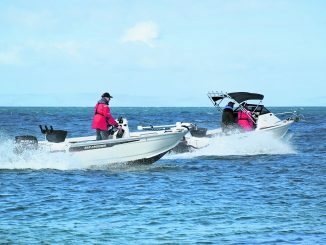 The test boat didn’t have an underfloor kill tank as is popular in east coast boats. Instead, it’s fitted with extra fuel capacity. This Trident carries 250L underfloor to allow a theoretical range of around 400km. The compromise is that you need to bring an icebox for the fish. 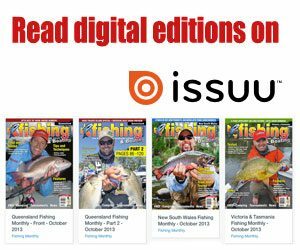 That’s not uncommon for WA, where anglers are used to traveling distances to access spectacular fishing. Supplied on a Quintrex twin-axled aluminium I-beam trailer, the rig weighs in at under 2,500kg fuelled and loaded. This means that it can be towed behind nearly all twin-cab 4WDs with relative ease. 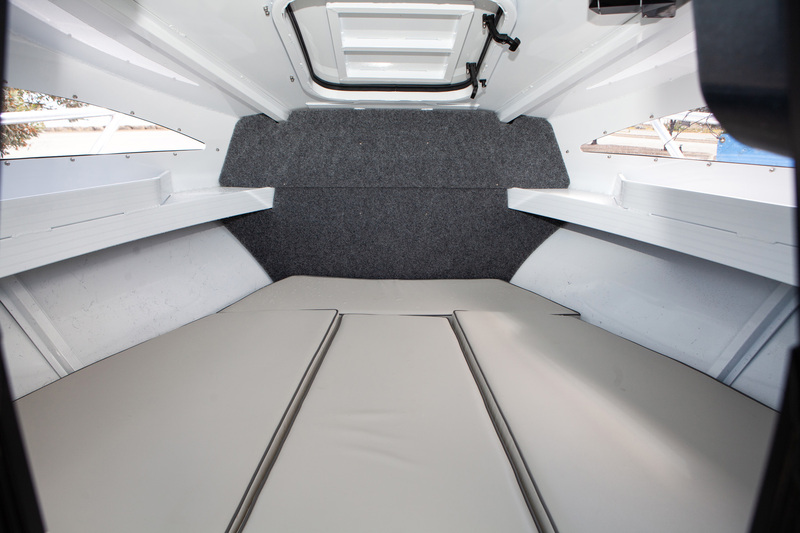 A fold down boarding ladder and transom door lets your mates or family easily load while at the ramp. 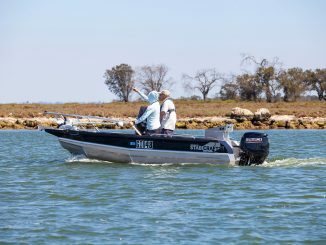 The transom mounted bait board and port-side livewell allow you to get the job done down back when you reach your destination. 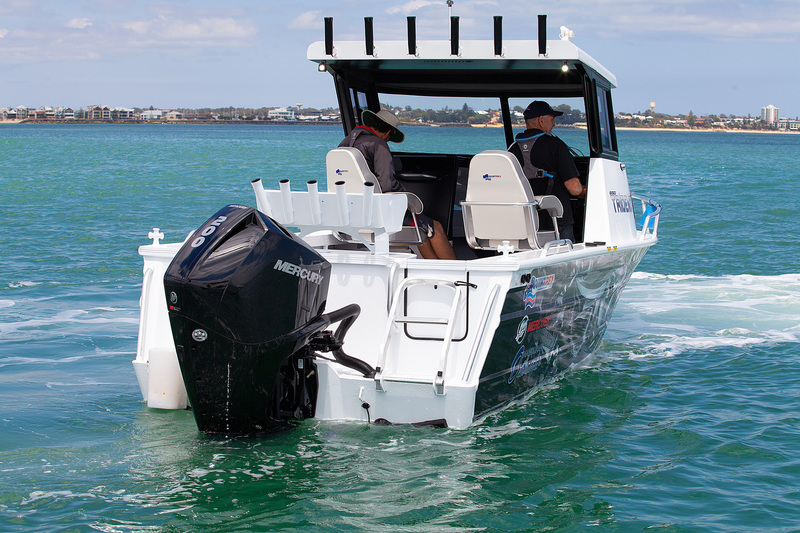 I wasn’t a big fan of the deckwash and fuel filter taking up side pocket space – even though they’re accessible for maintenance and inspection. I was a fan, however, of the tiltable rocket launcher rod tubes. I’m 5’10” and often have trouble loading the higher launchers and I appreciate the ease of which these are loaded. 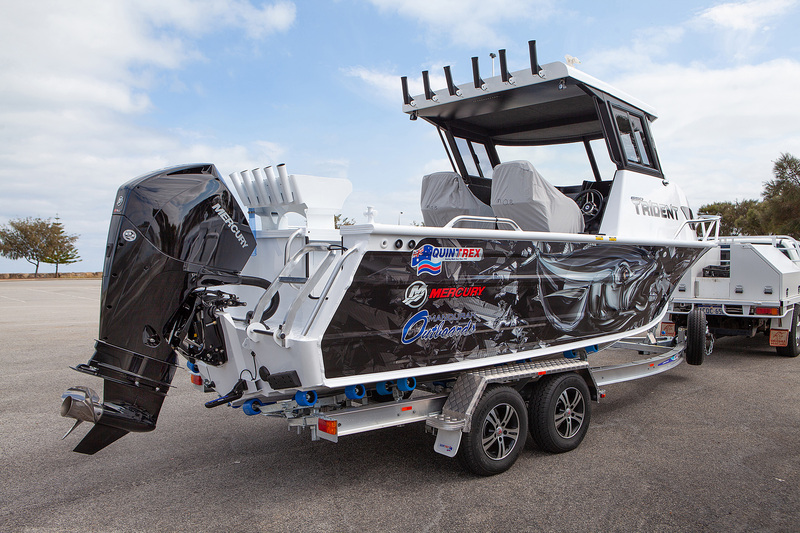 As tested, the Trident weighed in at $105,536. 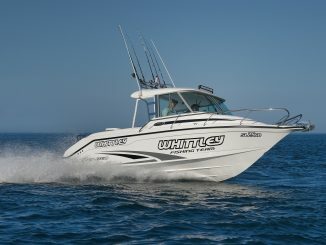 Visit www.mandurahoutboards.com.au for details and Like their Facebook page (Mandurah Outboards) for specials and updates.